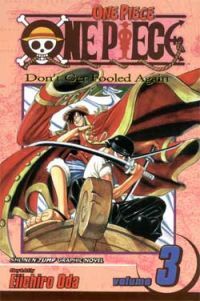 The super-powered pirate showdown continues, with Monkey D. Luffy's rubbery limbs tested to their limit against the fiendish Captain Buggy's Chop-Chop powers. Worse, Captain Buggy reveals an unexpected connection between himself and Luffy's long-lost hero, Captain "Red-Haired" Shanks. Meanwhile, Luffy and his tiny crew must endure the Trial of the Forest on a remote jungle island if they hope to find the elusive One Piece.